Children don’t understand fairness in the same way as adults do. 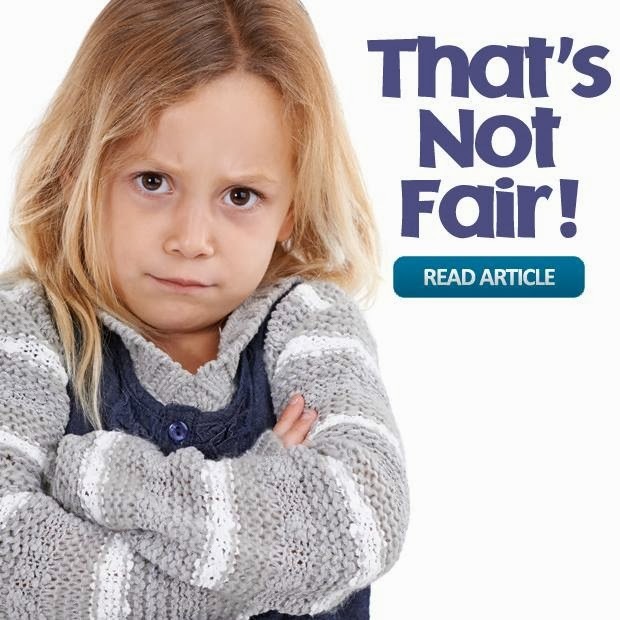 When a child isn’t getting what they want, they say “It’s not fair.” In this special article by Daniel Darling, you’ll discover three important keys you can begin using today. If you read Paul’s account of the Fall in Romans, you’ll discover that it was this attitude–ingratitude and entitlement–that lit the match of sin, plunging Creation into darkness. And it’s a surefire way to test your own heart, to see where the idols are. First, you are right in saying that life isn’t fair. Because it’s not fair that little children go to bed hungry this very night, having eaten nothing but a handful of rice and here you’ve just had seconds on French fries. It’s not fair that some boys and girls grow up without a mother and father, orphaned by a war they didn’t start. It’s not fair that some children won’t even see many birthdays, succumbing to diseases we treat with immunizations and routine trips to the doctor. So if there is a complaining about being fair, it’s you and me and all of us in prosperous, free America on the other side of “Not fair.” So in the line of people complaining about a bad lot in life, we are several zip codes away from the front. Most of the world is pointing to us and saying, “Life isn’t fair” and they have a much better case. Second, you really don’t want life to be fair. We all have a scale of what is just–but the problem is that we are human and not God. He actually holds the scale and the Bible says to us that it’s weighed down heavily in favor of His mercy. Listen to the words of the prophet, Jeremiah, “It is of his mercies we are not consumed” (Lamentations 3:22). In other words, because of our sin against Him, it is overwhelming mercy that we are not immediate targets of His judgment. Instead, we are beneficiaries of His grace. We really don’t want God to be fair, but to be just. What’s unfair is Jesus’ assuming our wrath and guilt on the cross on our behalf so we could be restored to a right relationships with God. And on a more personal, pragmatic, earthly level, we should ask ourselves: do we really want God to even out the score? For us in wealthy, rich America, that might mean taking some things away from us and giving them to the less fortunate. Or someone more appreciative. Third, a heart of ingratitude and entitlement is evident of a deeper problem with God. This is what worries me most about entitlement. It is saying to God: I do not trust you to be my Father, to take care of my needs, to love me and care for me. Worse, it elevates self to a god-like position. Ingratitude says: I know better what is good for me. I’m a better god than God. When we say, “That’s not fair”, we are saying to God, you haven’t distributed things as evenly as I would. Even though I’m a sinful human, I know much more about what is just and right than you. That’s a dangerous position to be in, because we know from Scripture that God is the perfect Heavenly Father and to trust ourselves to our own care, our own lordship, only spells disaster (Proverbs 14:12; Matthew 7:9-11). You don’t want to go through life as your own lord, your own god, your own master. You only have to look around at the misery and despair in the world to see that’s not a path worth pursuing. First, the cure for ingratitude and entitlement is the gospel. We don’t simply want our kids to “buck up”, but we want them to be sanctified by the Spirit of God. You see the gospel cures our entitlement syndrome by reminding us that Jesus is enough. It reverses the curse of the Garden. It answers Satan’s lie about God by pointing to a bloody cross and a suffering Savior. It says: God did provide all you need. God is your Father. Anything else you think you need is a cheap, worthless, soul-crushing substitute. Second, the gospel nurtures in us a healthy sense of justice. You see there are imbalances in the world, but rather than looking inward at what we think we lack, God’s love teaches us to look outward at the injustice in the world. As members of Christ’s kingdom, we now become part of His plan to heal and restore. We stop looking at our own lives and saying, “It’s not fair” and we start looking at others, who are suffering under the weight of the Fall and we devote our lives to getting involved in alleviating injustice around us. When we give up our own entitlement for the sake of others, we become a small window into the Kingdom to come, where Christ will fully restore all things. Third, resisting ingratitude early on helps us avoid unnecessary disappointment and sorrow later in life. y of trial and hardship that is brought on simply by unrealistic expectations of what God is supposed to give us in this life. The entitlement mentality is never happy, always looking for what is mine. This is a fruitless, miserable pursuit. But a gospel-centered gratitude that recognizes God as Father and giver of good gifts helps us enjoy the blessings we already have, to revel in the grace we possess rather than wishing for things we think we are owed. In a sense, it’s the reverse prosperity gospel. In Summary: Don’t let your kids say the phrase, “It’s not fair” about their own situation. It’s the phrase that pays in misery and alienation from God.